TweetDeck aims to evolve the existing functionality of Twitter by taking an abundance of information i.e twitter feeds, and breaking it down into more manageable bite sized pieces. From a poster's point of view, it supports shortening URLs by a couple of different services, posting and hosting images at different sites, and scheduling tweets to be posted even if you're offline. TweetDeck is also a platform with 2 apps listed on AlternativeTo. Browse all 2 apps for TweetDeck. TweetDeck was added by Stuck in Feb 2009 and the latest update was made in Oct 2018. The list of alternatives was updated Mar 2019 There is a history of all activites on TweetDeck in our Activity Log. It's possible to update the information on TweetDeck or report it as discontinued, duplicated or spam. 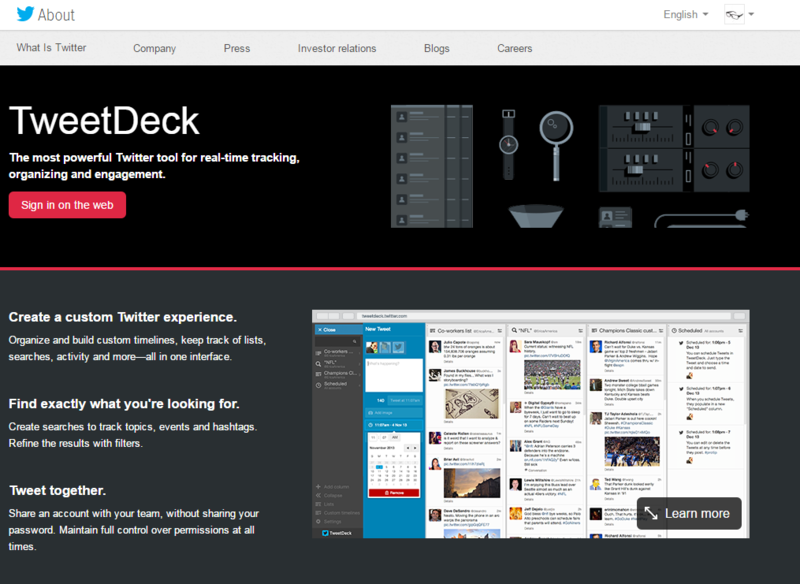 Alternatives to TweetDeck for Windows, Mac, Android, iPhone, Web and more. Filter by license to discover only free or Open Source alternatives. This list contains a total of 25+ apps similar to TweetDeck. TweetDeck's UI is sooo much better than the standard web-interface for Twitter! Recommended!